Explanation: What if the atmosphere above you became one gigantic lens? This actually happens when a nearly transparent sheet of pyramid shaped ice crystals falls from the sky in a common orientation. These ice-crystals act together like millions of miniature ice mirrors, with external and internal reflections from different faces creating arcs and halos of different radii. An amazing display of pyramid ice crystal halos was captured on June 5 above Tampere, Finland. Visible above are very unusual sun halos of 9, 18, 20, 23, and 24 degrees. In contrast, thin and flat falling ice crystals will produce a halo of 22 degrees only. The high clouds containing the ice crystals are faintly visible, as are some sundogs. 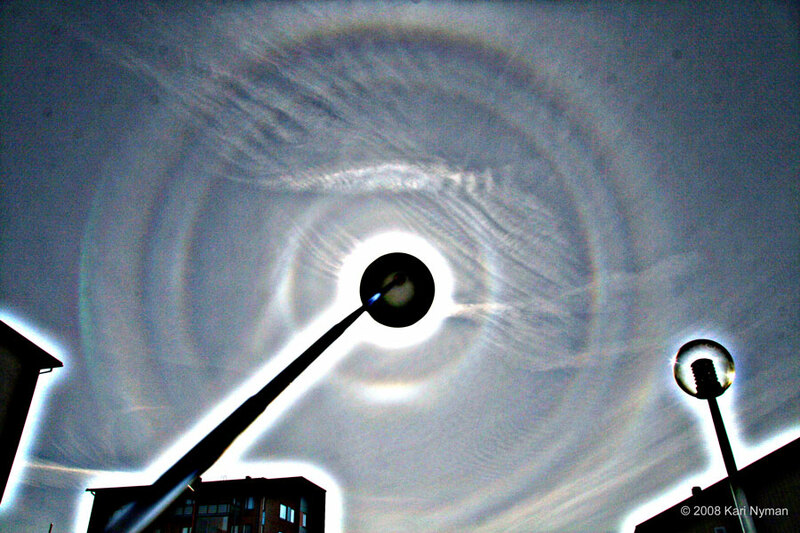 The usual Sun image was covered behind a light post, and the above image was significantly digitally sharpened. It is not currently known how large areas of nearly uniform pyramidal ice crystals form.